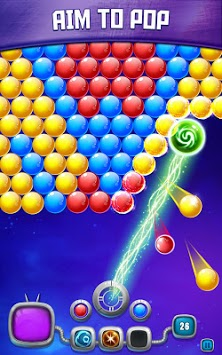 Bubble Galaxy Master is the ultimate bubble shooter game. You'll be thrilled with this super addictive action and adventure challenge. These fun puzzles put all your skills to the test as you blast your way through space and become a bubble popping master! Blast colorful balls and pop balloons with no internet connection needed. Download this free game, journey across the galaxy, and discover new puzzle levels! 1. Aim and shoot at least 3 bubbles of the same color. 2. 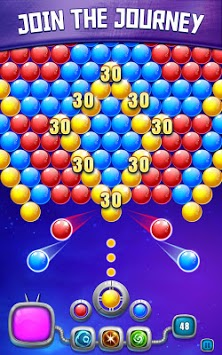 Pop more than 3 balls at one shot and see them explode and clear the board. 3. Use boosters to create major explosions – colorful balloons will smash and pop before your eyes. 5. Reach the target of every level and earn 3 stars. - Online and offline game mode. No WiFi and no internet connection needed. - The best free bubble shooter game for your Android device. - Brain teasers and challenges: While this is an action game, it is also challenging your logic skills and strategy. Use tactics, and test your logic! - A relaxing and easy game. New Boosters That are Out of This Galaxy! Beam Booster make great explosions with the booster's laser that clears all the bubbles in its path. 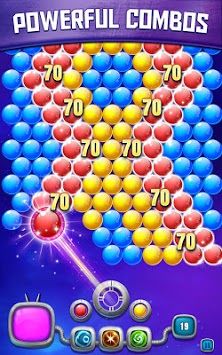 Stereo Booster clears 5 balls in a horizontal row to speedily clear levels and level up. Sparkling Booster makes everything around it explode into a shower of colors. Enjoy the stunning effect of major balloon explosions erupting around the screen. Remember, more boosters mean better blasting power and more popping all around! Start your fun time in space and download an addictive puzzle game! Get the bubble blasting adventure craze today!